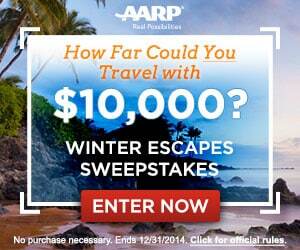 You Could Win $10,000 from the AARP Winter Escapes Sweepstakes! You are here: Home / Sweepstakes and Contests / contest / You Could Win $10,000 from the AARP Winter Escapes Sweepstakes! You don’t have to wait until retirement to go out and do all of those vacations you always talked about. How would you like to travel around the country with a cool $10,000 in your name specifically for traveling expenses? Well, this winter you can. I’m sure you all remember AARP’s last big sweepstakes in October. They’re back at it again! This time, you will have a chance to win $10,000 when you enter the AARP Winter Escapes Sweepstakes. This sweepstakes is open to anyone ages 45 and up. It ends this December 31st. AARP asks that I stress that there is no purchase necessary to increase your chances of winning. To enter to play this sweepstakes, click here. Good luck!